Apple on Thursday updated its lowest priced 16GB iPod touch, a move that came unexpectedly even as most of the industry has a close eye on Cupertino's every move leading into the iPhone 6 and the rumored iWatch launch. The company introduced a new model of the entry-level device with a 5-megapixel iSight camera, which previously wasn't available on the 16GB iPod touch, in addition to new availability in pink, yellow, blue, silver, red and space gray. Previously the 16GB iPod touch was only available in space gray, and buyers interested in a colorful unit had to choose a 32GB or 64GB model. It's now just $199 instead of $229, Apple said. Additionally, Apple dropped the price of its existing 32GB model to $249 and its 64GB model to $299, a $50 and a $100 price drop, respectively. 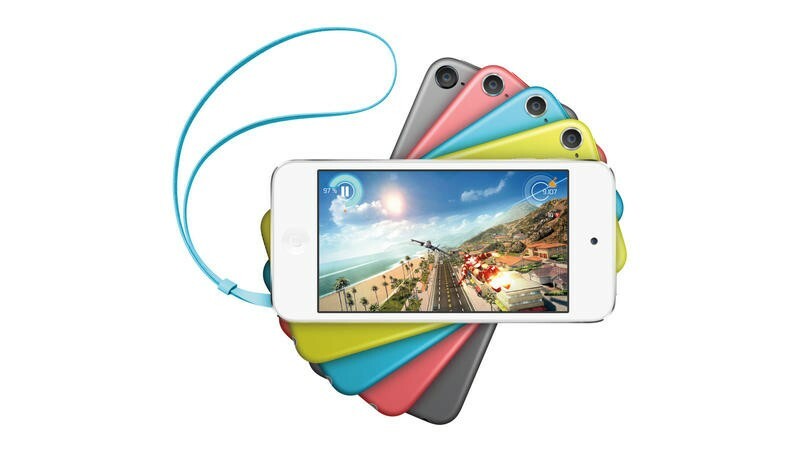 The new 16GB iPod touch is available in the United States now but will be available globally in the coming days. 9to5Mac noticed that the new entry level model also doesn't ship with the Loop accessory you see above, in case that's a deal breaker. You can pick one up from Apple's site online and it should be available in Apple Store locations as well. CUPERTINO, California—June 26, 2014—Apple® today announced its 16GB iPod touch® is now available in vibrant colors and equipped with a 5 megapixel iSight® camera for just $199. The entire iPod touch lineup features the 5 megapixel iSight camera with 1080p HD video recording, brilliant 4-inch Retina® display, Apple's A5 chip and FaceTime® camera. iPod touch features an ultra-thin and light anodized aluminum design and is available in pink, yellow, blue, silver, space gray and (PRODUCT) RED. iPod touch comes in a 16GB model for $199, 32GB for $249, and 64GB for $299. iPod touch comes with iOS 7, offering more than 200 features including Camera app filters that let you easily add real-time photo effects. Additionally, the Photos app offers ways to automatically organize your photos based on time and location. With iCloud® Photo Sharing, it's simple to share photos and videos with exactly the people you want to see them and your friends and family can comment and access their shared streams from any iPhone®, iPad®, iPod touch, Mac® or PC at any time. This fall, iOS 8 will be supported on the entire iPod touch lineup. With the revolutionary App Store℠ on iPod touch, users in 155 countries have access to over 1.2 million apps for iPhone, iPad and iPod touch, including hundreds of thousands of games. More than 75 billion apps have been downloaded from the App Store. Customers also have the iTunes Store® at their fingertips, giving instant access to an incredible selection of music, TV shows, movies and books to purchase and download directly to their iPod touch.